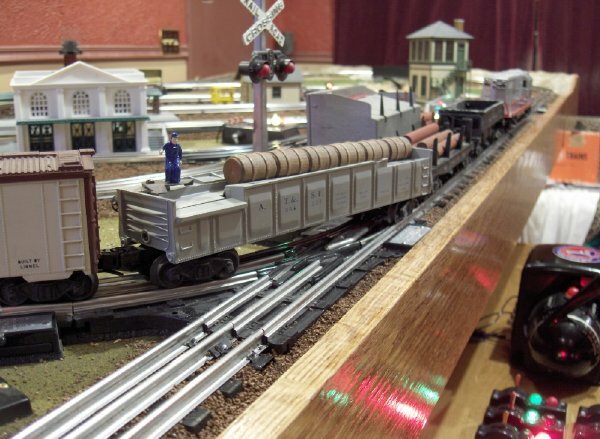 Custom Built Lionel O-Gauge Layout. Perfect Christmas gift for the whole family! Trimmed in beautiful stained oak, this furniture-grade layout has all the features the Lionel fan could want. Just add a transformer and it’s ready to run. First, we started off with heavy-duty framing consisting of 2” x 4” stud grade lumber and a ½” plywood table top. The sturdy and beautiful oak legs feature extreme-duty 360 degree swivel castors for ease of moving. Another awesome feature of the table is the hinged end leafs which allow you to expand the layout from 6 feet to a full 11 feet long, giving you all the length you need to highball down the mainline! And when you want to store it away, simply fold the end leafs down and the layout becomes a space-saving 4’ x 6’. (The layout can still be operated with the leafs folded down.) Folding and unfolding the table leafs is literally a one-person operation and is just one of the many special features that I will go over with the buyer when I personally deliver and set up the layout in your home. This feature also makes this layout ideal for those folks who have limited space. The oak control panel is just another in a long line of truly custom options with which this layout was designed and built. 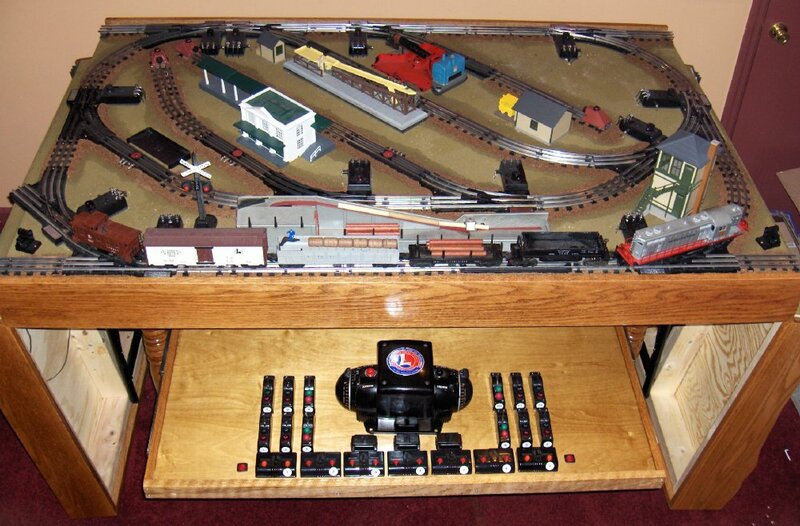 Using heavy duty full-extension drawer sliders, the control panel slides completely under the table and out of the way when the layout is not in use, and slides back out when you want to run the trains. The control panel is oversized, leaving you plenty of room for future expansion should you decide to add more switches, accessory controls and command control to the layout. 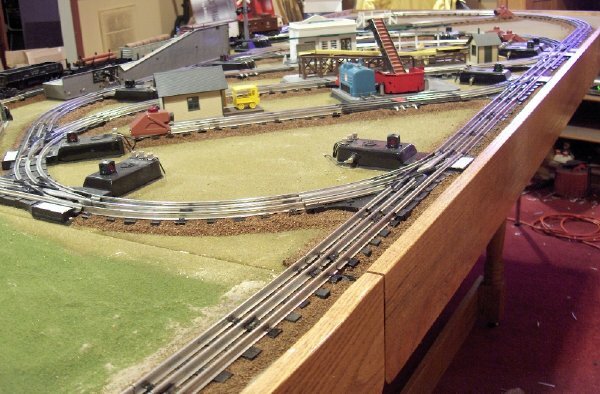 The business side of the layout features an action-packed track plan with 12 remote switches, 4 sidings, a passing track, 7 UCS uncoupling/operating track sections, a reversing loop and everyone’s favorite postwar accessories. Even experienced operators will enjoy performing challenging yard duties and switching operations. The tracks on both end-leafs are block sections controlled by illuminated rocker switches on the control panel. This feature allows the operator to have up to 3 conventional locomotives on the layout at once. All of these features combine to give the operator an immense variety and will provide endless hours, years and generations of fun! The entire table is covered with Woodland Scenics realistic grass mat. Next, all track was laid on top of foam track bed and there are over 300 hand-laid individual wood rail ties and hand-laid ballast! One end of the layout features a serene park, pond & creek. A Lionel die cast girder bridge provides the right-of-way over the ravine & creek. All wiring features quick disconnects and is labeled and tucked up under the table’s framework for a professional appearance. Heavy duty bus bars route power to the individual switches, uncoupling tracks and accessories separately from the track power. Everything you see in the photos is included with the layout, aside from the ZW transformer. The beautifully restored postwar 2328 Burlington GP-7 diesel locomotive, postwar 2338 Milwaukee Road GP7 locomotive(highly prized full orange stripe version), postwar 3562-25 operating barrel car, postwar 3461 operating lumber dump car, postwar 3662-1 operating milk car & platform & the postwar 3469 operating coal dump car. 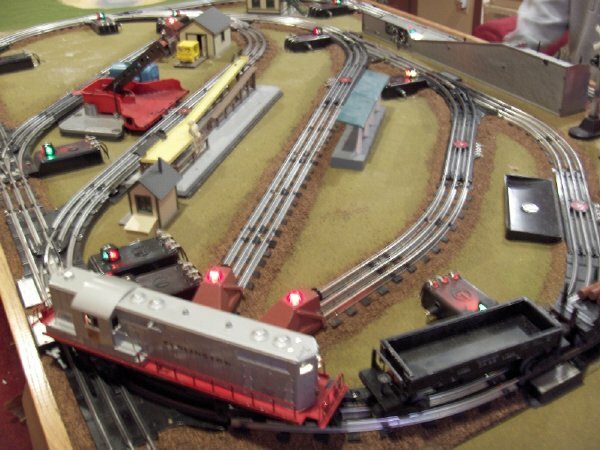 Unfortunately, I cannot ship this layout via truck freight because I cannot crate it. Free delivery is only available within 200 miles of zip code 07480. Once payment is received, we will work with the buyer to set up a convenient date and time for delivery. Once we arrive at your home, set up and orientation will take approximately 2-3 hours. Or we can work on a plan where you can bring your truck here where I will give you the orientation on the operation of the layout as well as how to set it up once you get it home and assist you in loading it into your truck. I welcome any and all questions from folks who are seriously interested in purchasing this finely crafted Postwar Lionel O-Gauge Layout. Payment via cash or certified bank check only, please. Additional photos are available. PM me with your e-mail address if you're interested. im not trying to make fun of ur hobby but...how is watching a toy train go in circles fun? The trains don't just go in circles, by the way. They can take many different routes around the layout, stop off at accessories and load & unload coal, lumber, barrels, milk cans, etc. 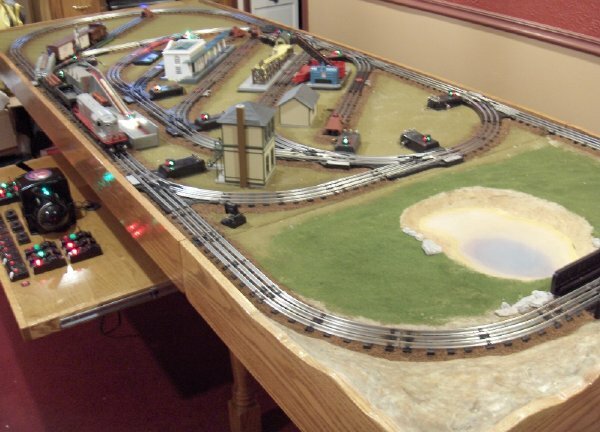 i have a nice HO layout myself it isnt watching trains go in circles. The fun is in building it. it takes alot of work. Good luck, I love vintage train sets. Have a ton of Postwar Flyer stuff myself. Thanks, guys. I usually sell 2-3 layouts like this one every Christmas season, but it looks like it's going to be tougher this year with the economy being what it is.